Adam Cloe has been published in various scientific journals, including the "Journal of Biochemistry." He is currently a pathology resident at the University of Chicago. Cloe holds a Bachelor of Arts in biochemistry from Boston University, a M.D. from the University of Chicago and a Ph.D. in pathology from the University of Chicago. The shoulder is a complex joint with multiple tendons and muscles surrounding it. Diagnosis of muscle and tendon tears within the shoulder requires tests that allow visualization inside the joint. Arthrograms and MRI scans are different tests that can be used to detect damage to the rotator cuff. The rotator cuff, according to the American Academy of Orthopedic Surgeons, is a series of four muscles and their tendons that surround and stabilize the shoulder joint. These muscles keep the top of the arm bone, also known as the humerus, in the shoulder joint. Tears in any of the muscles or tendons in the rotator cuff can cause shoulder pain and loss of motion in the shoulder joint. An arthrogram, RadiologyInfo explains, is a procedure in which a dye is injected into the shoulder joint. This dye, which is also known as contrast, can be seen on an X-ray. When this dye is injected into the shoulder joint, it spreads throughout and allows a physician to better see all of the muscles and tendons in the shoulder. 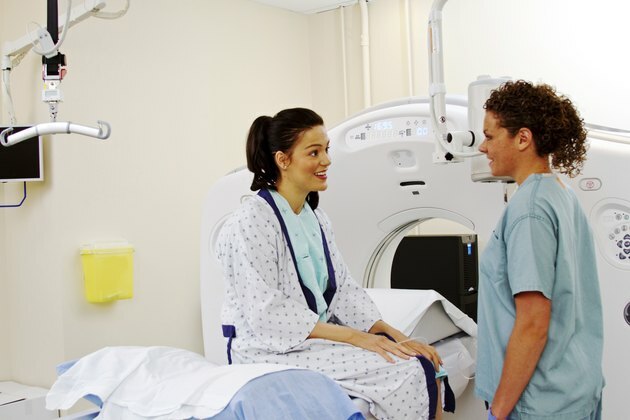 MRI, which stands for magnetic resonance imaging can be used to examine the bones and soft tissue within the shoulder joint, EHealthMD explains. An MRI uses magnetic waves that cause the tissue within the shoulder joint to emit faint magnetic signals. These signals are then detected by computers, which process the signal to produce images of the shoulder. In some cases, an arthrogram can be done using the same technology as a MRI, RadiologyInfo explains. With this kind of test, a contrasting dye is injected into the shoulder, though this dye is different than that used in a standard arthrogram. Then the MRI is performed. The contrast dye helps outline the muscles and tendons within the rotator cuff. A 2000 article in Rofo, titled "Arthrography, ultrasound and MRI in rotator cuff lesions: A comparison of methods in partial lesions and small complete ruptures," compared the effectiveness of arthrography and MRI scanning in diagnosing rotator cuff tears. This study found that although both methods were similarly effective at diagnosing complete tears within the rotator cuff, MRI images were better at detecting partial tears.